It’s going to be a cold winter. Or at least that’s what I’ve read in the papers – based on varying predictions to do with cold wind from Siberia or lots of berries on holly trees. Or maybe just memories of last winter. Whether those dire predictions come true or not, I’m going to make another which will sadly almost certainly come true: tens of thousands of older people will die this winter. Those deaths aren’t inevitable. But they’re probably going to happen anyway unless we do something about it. 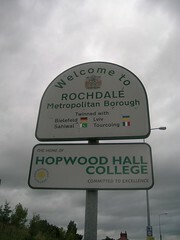 It takes just 2 hours to get to Manchester from London and only another 20 minutes to get to Rochdale by train. But when we arrive at the small cul-de-sac of bungalows, it feels a long way from Westminster and the Comprehensive Spending Review. But it is in places like this that the impact will be felt. My colleague and I are in Rochdale to meet with a group of older people. The driving force behind the group – I’ll call him Mr Jones – contacted Age UK because he was concerned about the state of the little cul-de-sac where he and his neighbours live. I’m hoping that the group will take up our new Change One Thing campaign. We’re going to be supporting local groups of people in later life to campaign to make their neighbourhoods better. We’ve arranged to meet at the house of Mr Jones’ next-door-neighbour. While she makes us a cup of tea, Mr Jones pops across the cul-de-sac to gather the others. In the end we have a group of four. We start to explore the problems that they face. Graffiti, litter and poor service from council and housing association contractors are all mentioned. Two themes emerge from what they say. One is the degree to which they depend on ‘the powers that be’ (mostly the council and the housing association) for things like household repairs and maintenance, and the constant battle they feel they are waging to be heard by those powers. The other is the support they give each other, and the sense of community they obviously have. I’m interested to see what the Big Society might look like here. After quite some discussion, and with our encouragement, they settle on one issue to tackle: the poor state of the pavements in the cul-de-sac. Then we go on to think about who could deliver this, and how they can go about organising a campaign to persuade them. If they can organise themselves, and stay focused, I think they have a reasonable chance of success. After all, in many ways, it’s a no brainer – the cost of repairing a few pavements is trivial compared to the cost of treating a hip fracture, or of providing home care to someone who is unable to get out and about after a fall. But with cuts to council budgets inevitable, I have a nasty feeling that pavement repairs is exactly the kind of thing which may just not happen in the future. Let’s hope that councils will take the challenge of seeing the big picture.